Editor’s Note: A version of this piece was originally published on Still Stoked with text from Alexa Hohenberg and photos from Melanie Williams. You can follow @Still_Stoked on Instagram. On the same pivotal day that Saudi Arabia lifted a ban on women driving, six women made their own leap toward gender equality in Puerto Escondido, Mexico. 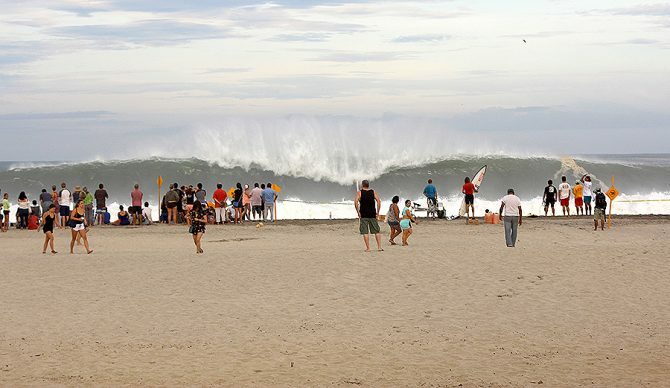 The surfers charged massive waves for the first time in competition at Puerto, one of the heaviest beach breaks in the world. Mexico’s Isabelle Leonhardt followed Valenti in the final standings, with Keala Kennelly coming in third, Raquel Heckert, Emily Erickson, and Polly Ralda rounding out the standings. The ladies surfed with such confidence and skill that event organizer Gary Linden said some of them would have moved through their same heats in a men’s event. He confirmed that this was the best women’s big wave surfing event he’d seen. “I’m proud of all of the girls. I feel like we were just charging. I’m gonna sleep so good tonight,” Keala Kennelly said. It’s a thrill to see the scales at a tipping point with support starting to help women’s surfing take a big step in the right direction. Linden even put up his own cash as prize money for the women, as well as confirming The Bad Stuff Tequila sponsorship for future women’s big wave surfing events. Everyone’s optimistic about the possibilities of more sponsorship and more equal prize purses. At Puerto, first place for the women took home $1,750 USD while $7,000 was up for grabs for a first-place finish in the men’s division. Although the winning men would have surfed more heats due to the number of competitors, this discrepancy did not go unnoticed in the surfing community amongst both genders. “The risks are the same so why aren’t the prizes the same? I think we deserve it,” Emi Erickson asked. Regardless, thank you, Gary, for being an absolute legend and true supporter of women’s surfing!